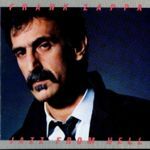 All compositions executed by Frank Zappa on the Synclavier DMS with the exception of "St. Etienne"
This album was rewarded with a Grammy Award. Although 100% instrumental, Tipper Gore managed to get the "Parental Advisory: Explicit Lyrics" sticker on this album. ST-74205 1986-11-25 0013347420516 US edition. 4XT-74205 Not sure 0013347420547 US edition, XDR. EMC 3521 1986-12 5099924067317? UK edition. TCEMC 3521 1986-12 5099924067348 UK edition, XDR. 1A 064-24 0673 1 1986 5099924067317 Dutch edition. 58980 81 2406731 ? Argentinian edition, titled Jazz Desde El Infierno, EMC 3521-1/2 on labels. RCD 10030 1987-04? 0014431003028 US edition, DDD. TCP 2472 (2 40673 4) 1990? None US edition, XDR. TZAPPA 32 ? 5016583603243? UK edition. CDZAP 32 1990-09 5016583603229 UK edition. VACK 5050 1994-11-25 4988112405899 Japanese edition. 968045 1995 7897181225543 Brazilian edition. VACK 5134 1995-10-25 4988112407923 Japanese edition. VACK 5269 1996-05-30 4988112408692 Japanese edition. VACK 1258 2002-11-27 4988112413573 Japanese edition, mini-album papersleeve. ZR 3875 2012-10-30 0824302387528 US edition, manufactured and distributed by UMe. 0238752 2012-10-30 0824302387528 EU edition = Zappa/UMe ZR 3875, manufactured in Germany. ↑ 2.0 2.1 2.2 Martin C. Strong, 2004, The Great Rock Discography, p. 1723. ↑ The Zappa Patio reports very small differences between pre and post 1990 records. This page was last modified on 2 May 2015, at 12:16.